Seasons provide non-ending learning experiences for children. They learn about the passing of time, change, weather, nature, light and dark etc. For many of our children this will be the first year when they are noticing things like the colour of the leaves and the fact that leaves fall off trees. Whilst for us this may not seem very exciting as we have experienced so many seasons in our lives, for young children this is all very fresh, exciting and enthralling. We provide our children with a wide range of experience to engage their curiosity, deepen their knowledge and keep their excitement about learning live.We have been out on many walks to look at the trees and leaves. The children are loving stamping on the piles of leaves on the embankments. We have collected leaves and brought them back to nursery. Pressing leaves is a great activity to learn about patience, the passing of time and change. The children checked the leaves they were pressing to see what happened to them and to talk about the change. We brought leaves back to nursery and used pestle and mortar to grind them down.This gives the children opportunities to observe change in matter and develops hand eye control and motor control. 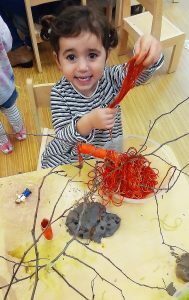 Our Art Teacher Anna shared images with the children of an installation that was created by Peter Liversidge and our children made their own Spaghetti Tree. 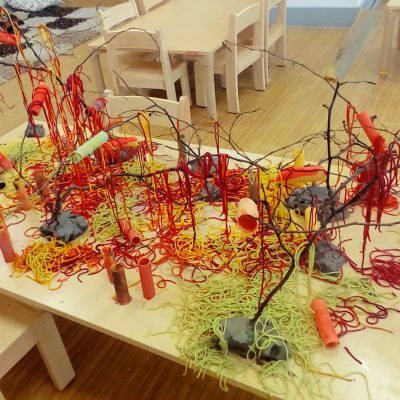 The activity involved collecting twigs, stripping them of leaves, placing them in clay so they stood up and then decorating them with coloured cooked spaghetti and dried conical pasta which they had painted in autumn hues. The children were very engaged in the activity, concentrating for long periods of time. They were fascinated by the effects they created. This activity involved the use of imagination, thinking and planning skills and developed creative skills. We were all very sad to have to take down our amazing installation at the end of the week.